A green-tinted whipped topping “rind” holds watermelon-flavored gelatin and chopped chocolate “seeds” for a fun summer dessert. 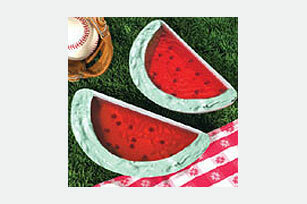 Mix COOL WHIP and food coloring until blended; spoon evenly into 4 freezerproof dessert dishes to resemble the rind of watermelon pieces as shown in photo. Freeze until ready to use. Add boiling water to gelatin mix in medium bowl; stir 2 min. until completely dissolved. Add ice; stir 5 min. or until gelatin is slightly thickened. Remove any unmelted ice. Spoon gelatin into prepared dessert dishes. Insert chocolate pieces into gelatin to resemble watermelon seeds. Refrigerate 30 min. or until gelatin is firm. Substitute 1 Tbsp. BAKER'S Semi-Sweet Chocolate Chunks for the chopped chocolate. This recipe can be changed to fit any holiday. Prepare as directed, tinting the COOL WHIP orange for Halloween and using JELL-O Orange Flavor Gelatin. Or for Christmas, tint the COOL WHIP red and use JELL-O Lime Flavor Gelatin, or tint the COOL WHIP green and use any red color gelatin.